Unlimited Telephone Technical Support throughout your workday - Access to our technical support hotline during local business hours, Monday through Friday (excluding holidays). Advance Parts Replacement full replacement of all covered failed components shipped for next business day delivery. Customs delays may affect actual delivery time in certain regions. Software Updates upon release to correct any software errors that prevent the system from performing to published specifications, as required. Software Upgrades major feature and functionality releases. Upgrades are available upon release. 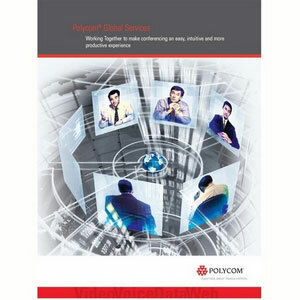 On-line Support access via the World Wide Web to extensive technical information on Polycom products, including a search and query function on the Knowledgebase, technical bulletins, tech tips and frequently asked questions. Test Facility face-to-face testing can be scheduled during local business hours (except holidays) with our technical support engineers, or take advantage of our around-the-clock video test facility with continuous motion and sound sources for quick, easy confidence checks. The Polycom 4870-00040-112 is also known as POL-487000040112	or 487000040112	.